The federal judge said he took into consideration Papadopoulos’s “genuine remorse” in issuing the light sentence, which included a $9,500 fine, a year on parole and community service. By lying to investigators, Papadopoulos had made “a calculated exercise of self-interest over the national interest,” said Moss. Papadopoulos has cooperated for more than a year with Special Counsel Robert Mueller’s probe into Russian interference in the US presidential election and possible collusion with the Trump campaign. He has testified that senior campaign members encouraged him during 2016 to build ties with Russia, including after he told them that Moscow possessed — and could be willing to share — dirt on Trump’s election rival Hillary Clinton. Those issues are now at the heart of Mueller’s sprawling investigation, which increasingly threatens Trump’s inner circle and the president himself. Trump has regularly lashed out against the sprawling probe he dubs a “witch hunt” driven by his Democratic foes. The 31-year-old Chicago native was a little-experienced petroleum analyst based in London when he joined the Trump campaign in March 2016 as one of a handful of members of the Republican candidate’s national security and foreign policy advisory board. Within weeks, he made contact with a mysterious professor, Joseph Mifsud, who touted links to the Kremlin and introduced him to others who ostensibly had connections to Russian President Vladimir Putin — including a woman who claimed to be Putin’s niece. At the end of March 2016, Papadopoulos told Trump, then-senator and now Attorney General Jeff Sessions, and members of the national security team at their first meeting in Washington that he had connections in London that could set up a Trump-Putin meeting ahead of the November election. 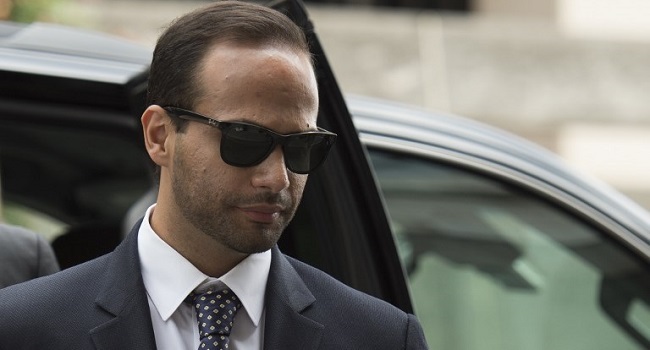 “While some in the room rebuffed George’s offer, Mr Trump nodded with approval and deferred to Mr Sessions, who appeared to like the idea and stated that the campaign should look into it,” Papadopoulos claimed in a pre-sentencing statement last week. Sessions has claimed he opposed the idea. In subsequent campaign communications, Papadopoulos was encouraged to pursue a Putin-Trump meeting. In late April, he told them that Mifsud said the Russians had information that could harm Clinton, in the form of thousands of emails. US investigators were only alerted to Papadopoulos’s activities in mid-2016 after he told Australia’s ambassador to London, Alexander Downer, about his talks with Mifsud during a late-night drinking session in a London pub. After the Clinton emails were leaked, the Australians told US intelligence counterparts what Downer had heard, spurring the FBI to begin investigating possible collusion between the Trump campaign and Moscow. In his pre-sentencing statement, Papadopoulos admitted lying to FBI investigators in January 2017 but said it had been out of a desire to protect his career and a naive loyalty to the Trump administration. The lies did not impede the investigation, he argued. “Caught off-guard by an impromptu interrogation, Mr Papadopoulos misled investigators to save his professional aspirations and preserve a perhaps misguided loyalty to his master,” the statement said.